Bordering the dune, the wide expanse of Moliets beach is sure to please young and old alike. The mouth of the Courant d’Huchet, which connects the Étang de Léon to the Atlantic, changes over time. 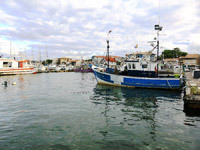 It provides diverse and remarkable seascapes on the Aquitaine coastline. Moliets beach has two bathing areas which are supervised by lifeguards between June and September. In addition to its bathing areas, Moliets beach also offers numerous leisure activities. You can relax, play in the waves, have surfing or bodyboarding lessons or even build sand castles. The vast expanse of Moliets beach is the perfect place for children and adults to have fun. On the right-hand side of the beach, at the foot of the dune, there is a dedicated kite flying area. Those who like to feel the wind in their hair will find unrivalled open spaces on the Atlantic Coast. Open all year, the special area is reserved for kite flyers. 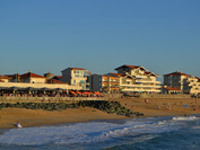 Like all the beaches of the Landes region, Moliets beach is also a great place to surf. The resort has a number of surf schools. It is also a dream location for anglers: surf casting. 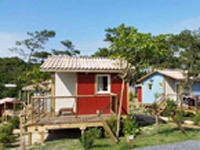 The beach can be reached directly through the campsite’s three private access points.